Watching red carpet, soon the top prizes of Cannes 2018. Today AFP gives us the most interesting news as this year will be the first time in 71 years of the festival where those Cannes main awards that used to receive diplomas will receive a mini-palmes d'or! 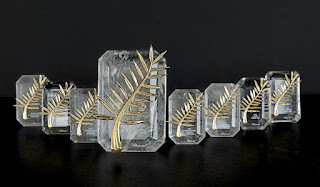 Friday May 18th Morning Update: more awards including winners from La Quinzaine and Cinéfondation. Friday May 18th Afternoon Update: Palm Dog award winners. Queer Palm award ceremony is tonight; tomorrow FIPRESCI and Ecumenical Jury awards ceremony. As there are some awards already announced and one parallel section over, will start the winners post today. Post will be in progress until the Official Awards Ceremony next Saturday.